Any departure from the following should be considered a fault, and the seriousness with which the fault should be regarded should be in exact proportion to its degree and its effect upon the health and welfare of the dog and on the dog’s ability to perform its traditional work, which includes acting as a functional companion. 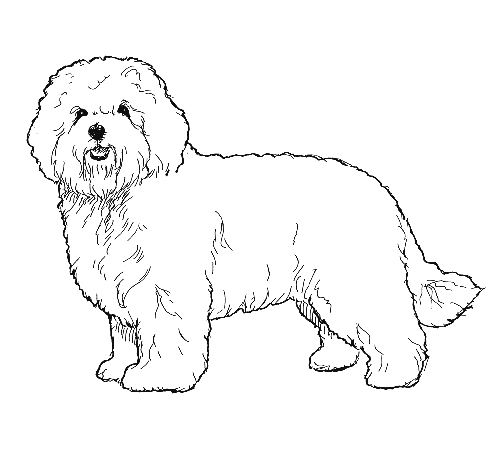 The Bolognese is an ancient Bichon type breed that originated in Italy. It was frequently given as a gift to noblemen and leaders. The Bolognese was recognized by the United Kennel Club on January 1, 1995. The Bolognese is a small, stocky, compact dog that is covered with a pure white, long fluffy coat. It must be square in appearance. Docile and serious, the Bolognese is a calm breed that is devoted to its family. The length of the head is approximately equal to 1/3 of the dog’s height at the withers. The skull is slightly longer than the muzzle, and the stop is well defined. The toplines of the skull and muzzle lie in parallel planes. Fairly flat on top, with only a slight occipital protuberance. The frontal bones are well defined and the cheeks are slightly convex in shape. Somewhat shorter than the skull, and square, with no taper towards the end and a very strong underjaw. Well-chiseled under the eyes. The lips are black and the upper lips are tight and do not cover the lower lips (no flew). A full complement of strong, white teeth meeting in a scissors bite is preferred. A level bite is permissible. The eyes must be well open, large and round, but eyeballs should not protrude. No white of the eye should be visible. Eye rim pigmentation is black and the iris is a dark ochre color. Disqualification: Complete lack of pigment of the eye rims. Wall eyes. Disqualifications: Dudley nose. Nose any color other than black. Set high on the head, long and hanging, but rather rigid at the base, which holds the ears slightly away from the skull and gives the head the impression of being larger than it is. Same length as the head. Free from dewlap. The shoulder blades are sloping, and have free action. The upper arm is the same length as the shoulder blade, but is more vertical in placement. Perfectly straight and parallel to one another, with short, slightly sloping pasterns. Dewclaws may be removed. Distance from the point of the shoulder to the point of the buttocks is equal to the height at the withers. The chest reaches to the elbow, and the ribs are deep and well-sprung. Sternum protrudes moderately in front of the point of the shoulder. The back is level to the loin, which is slightly arched. The croup is very broad and slightly sloping. There is a slight tuck up. Rear legs are straight from hip to foot when viewed from behind. Angulation matches that of the forequarter. The second thigh is longer than the upper thigh. There is little angulation at the hock joint. Rear pasterns are short. Oval in shape; with well-cushioned, dark pads and strong black nails. Set on the natural line of the croup, and carried curved over the back. Disqualifications: Natural bob or a docked tail. The hair is long and rather fluffy on the entire dog; somewhat shorter only on the muzzle. It lies in flocks, not fringe. The coat is shown natural length, with no trimming except for neatening around the bottom of the feet and for hygienic purposes. Pure white, with no patching or shading of any other color. Disqualification: Albinism. Any color other than white, or any patching or flecking of color in the coat. Height range for males is from 10½ to 12 inches, measured at the shoulders. Height range for females is from 9½ to 11 inches, measured at the shoulder. Weight averages from 5.5 to 9 pounds. Free and energetic, with high head carriage. Nose any color other than black. Any color other than white, or any patching or flecking of color in the coat. Natural bob or a docked tail.